We scheduled a trip from Santa Fe to Los Angeles to visit family and museums in the area around the opening of “Paris: Life & Luxury”, an exhibition at the J. Paul Getty Museum. 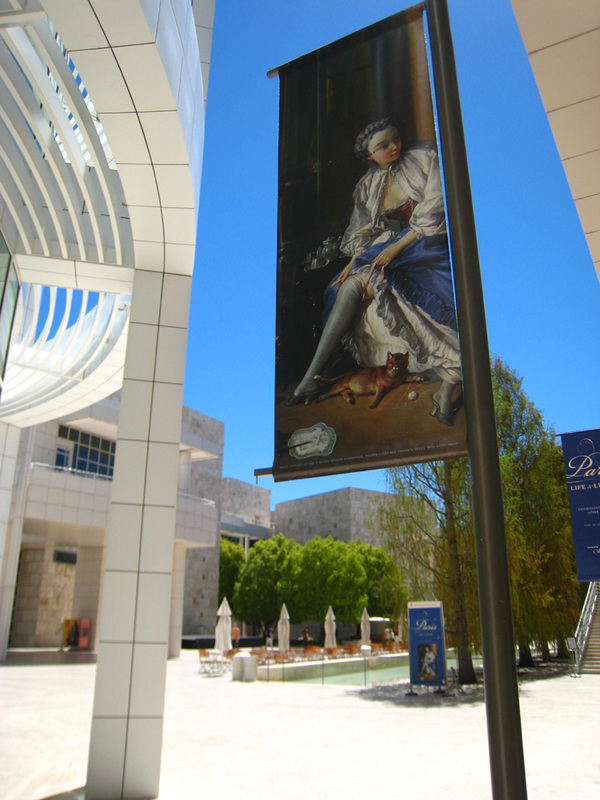 J. Paul Getty was known for his great collections of Antiquities and French 18th century decorative arts. He had a great eye for three dimensional works of art but was less adept at collecting paintings. In this area Scott Schaefer head of the old master paintings department has greatly improved the museum’s holdings. “Paris: Life & Luxury” is the brain child of Charissa Bremer-David, Getty Curator of Sculpture and Decorative Arts, accomplished with the assistance of Peter Björn Kerber, Assistant Curator of Paintings. It is one of those rare exhibitions that bring together all media in our specialty of French 18th century, including paintings, drawings and every aspect of the decorative arts. The mixing of media in the exhibition even extends to music with a harpsichord from the Metropolitan Museum accompanied by a recording of an 18th century composition played on a similar instrument. Sixty per cent of the works of art come from the Getty’s own incredible collections but they have also borrowed from twenty-six museums and private collections in several countries. Stiebel, ltd. lent an important pair of pastels by Jean Valade of the Marquis and Marquise de Favantines. One of them is highlighted in the exhibition and the other shown in the context of the museum’s paintings galleries in a room devoted to pastels. The exhibition will go from here to Houston in September where the Marquis and Marquise will be re-united in the second venue of the show. Last week I wrote about how in an exhibition I first want to see great works of art and then try to understand the point that the curator is trying to make. Here we have one of the best examples of a totally focused exhibition. The Getty’s acting director, David Bomford, summed it up in his inaugural remarks: he said that the show follows a day in the life of a not so typical Parisian family,… not so typical because few enjoyed the luxury that is shown here. We follow the family from getting up in the morning through to their daily prayers at night. This is perfectly set up with four small pictures by Nicolas Lancret (1690-1743) done in 1739, representing Morning, Midday, Afternoon and Evening, that are the first thing you see walking into the galleries. Many of the works in the show were old friends to me since my uncle travelled and shopped for French 18th century with J. Paul Getty in the 1950’s, we sold to him again in the 1970’s when he started to collect with the Museum in mind, and later directly to the Museum. 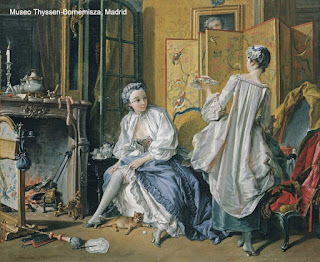 A key loan from another museum, François Boucher’s, “La Toillette”, was also familiar. We had handled it in 1967 when we received much of the collection of Baron Alphonse de Rothschild, Vienna, after the death of his widow, Baroness Clarice de Rothschild. We offered it to the Wrightsmans, great patrons of the Metropolitan Museum. Charlie Wrightsman, however, found the subject too risqué and passed on it. A few days later Baron Thyssen came in and snapped it up and it is now in his museum in Madrid. The Getty found it so appropriate and eye catching that a detail from the picture became the logo for the exhibition with banners all over. The image below was at the Getty Center. One of my favorite exhibits with a Stiebel provenance is called a Planisphere. 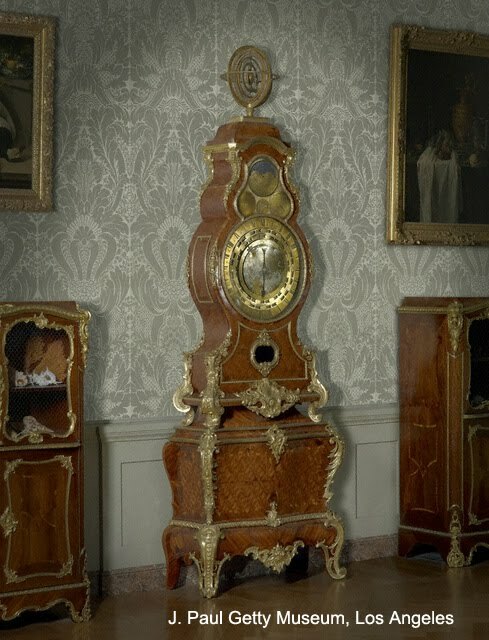 Attributed to Jean-Pierre Latz It is a Rococo marquetry and gilt bronze long case clock over 9 feet tall surmounted by an orrery (a three dimensional view of the solar system). Though there are no longer any works in the piece the original dials still exist showing the times in several cities and even California, as well as tidal flows in Northern French ports. It also gives astronomical information and has a series of bells which would signal various events indicated on the clock. Who would buy such a clock with no works? Certainly not a clock collector. But a Getty curator, Gillian Wilson, predecessor to Charissa Bremer-David, understood its important combination of art, history and the advancements of the sciences in the 18th century France. There is something very satisfying in a well thought out exhibition. It was particularly rewarding to see the unexpected crowds of visitors, fascinated by the very same works they would have passed by quickly in the permanent galleries, but were made engaging and accessible by their interpretation as part of daily life.